The adidas by BAPE® limited-edition capsule collection takes cues from streetwear and football culture to deliver an instantly classic and highly-coveted aesthetic. 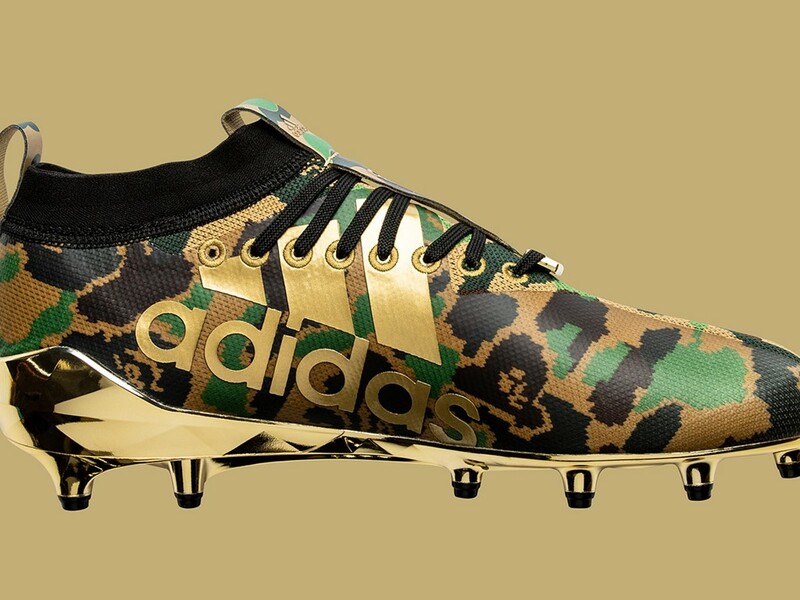 The distinctive collection features the BAPE® CAMO print, applied to a range of adidas Football cleats and adidas apparel and footwear silhouettes, and includes the adizero8.0. cleats, UltraBOOST running shoes, Z.N.E. Hoodie, football jersey, tights, arm sleeve, adizero gloves, football& helmet. adidas Football by BAPE® adizero 8.0 Cleats – Engineered for football’s fastest players, the adizero takes the football cleat silhouette to the next level by merging the iconic BAPE® CAMO print with a sneaker profile and redefined fit, feel and lightweight construction. The knitted bootie upper delivers lightweight comfort, while the SPRINTLOCK embroidery adds a reinforced lockdown fit in the forefoot and a PU sock liner delivers elevated cushioning. A TPU overlay delivers provides protection and durability and the cleats are powered by a SPRINTFRAME plate with SPRINTSTUDS in rotational traction zone pattern to provide speed and multi-directional strength and traction. $200. adidas by BAPE® Football– Handmade in Texas, the regulation size adidas by BAPE® Football is created with a chain stitch construction, reinforced inner liner, double lacing and composite outer layer featuring BAPE® CAMO print and metallic gold panels. The gold panel is highlighted by custom red, white and blue APE head logo and the BAPE® CAMO print is highlighted by a gold adidas badge of sport logo. $60. The limited-edition adidas Football by BAPE® capsule collection will be available exclusively at a Social StatusPop-Up Store (433 Bishop; 433 Bishop Street NW Atlanta, GA 30318) on 2/1/19 and release on adidas.com and BAPE® stores worldwide on 2/2/19. For more information, visit https://news.adidas.com/ and join the conversation on Twitter and Instagram via @adidasFballUS | #teamadidas.